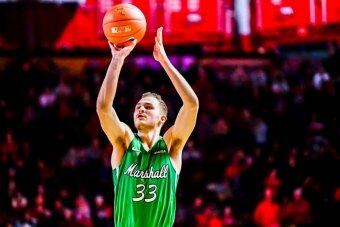 When Jon Elmore steps on the court Sunday afternoon at North Texas, it will be his 125th game in a Marshall men's basketball uniform. That will be tied for the fourth-most in school history with Skip Henderson, who also happens to be the Herd's career scoring leader. Elmore, a senior with a minimum of four games remaining, is 123 points behind Henderson for the all-time points record, but the current Herd guard already ranks first in school history in 3-pointers, 3-pointers attempted, free throws, free throws attempted and assists. He recently moved into fifth place in MU history in steals, and, believe it or not, has cracked the top 30 in career blocks. That is the kind of stat fodder Elmore has produced during his decorated career here, which continues Sunday at North Texas in the Thundering Herd's final regular season road game. He has put up massive numbers – across the board – and with Coach Dan D'Antoni and a talented roster, has helped bring rings and banners back to Huntington. Elmore has a chance to make more history Sunday in Denton, Texas. You see, Elmore is 5 points from tying UTEP's Stefon Jackson for the Conference USA record for career points. Elmore has 2,541. Jackson had 2,546 from 2006 to 2009. Elmore already has the conference's career assists record, as his 736 are well ahead of the previous record holder, UTEP's Julyan Stone, who had 714. That led me to wonder: Does any men's basketball league in America have a career points leader and career assists leader who is the same person? It has to be quite an exclusive list, I thought. Turns out, it is. From the ACC to the Pac-12, from the Atlantic Sun to WCC, there isn't a single conference with a player who holds both the all-time points record and assists record. Not one. Elmore averages 20.1 points per game this season and 19.8 for his career, and he is coming off a 34-point outburst at Louisiana Tech on Wednesday. In that game, Elmore had twice as many points as shots attempted. The last time he visited North Texas he was held to 4 points, which is the only way the native of Charleston, West Virginia, doesn't create a new list in college basketball's history books on Sunday. By the way, Elmore is tied for third in C-USA history in career 3-pointers with UTEP's Randy Culpepper. Elmore is 28 away from the league record. Overall, Elmore is tied for No. 131 in college basketball history in career 3s along with Culpepper and two others. C.J. Burks is ninth in Marshall history in points and has cracked the top 20 in C-USA history in the same category. Against Louisiana Tech, Burks hit his 200th career 3-pointer, one of seven players in Marshall hoops history to reach the milestone. He needs two assists Sunday afternoon to reach 300 assists for his career, a feat accomplished by only 13 other Herd basketball players. Burks' 140 career steals rank ninth in MU history. Jarrod West is only a sophomore, but he ranks No. 15 in career steals with 120. He has 63 this season, which is fifth-most for a single season in school history. Only West and Sidney Coles have had two seasons of 55-plus steals. After his four 3-pointers against Louisiana Tech, West has cracked the all-time 3-pointers list at Marshall with 103. West ranks 25th. And, finally, Jannson Williams has 60 blocks this season, making him one of six players in program history with at least that many blocks in a single season. The others: Hassan Whiteside, Ajdin Penava, Omar Roland, Jean Francois Bro Grebe and Nigel Spikes. Williams has 89 career blocks, which ranks No. 13 in Herd history.